I saw some pears in the market today. Although I usually do not make desserts, I thought about my mother, Claudia, and her baked apple crumbles. She would slice apples and spread a oatmeal mixture on top and then bake it to sweet, gooey/crunchy delight. I decided to adapt her recipe to pears. 1. Cut the pears in half, top to bottom. Stem, core and peel the pears and rub with lemon juice. Tip: As well as fiving the pears a slight citrus note, the lemon juice prevents them from turning brown. If you wish you could skip the lemon juice and soak the pear halves in brandy, rum or your favorite kirsch for an hour, before proceeding to the next step. 2. Thoroughly blend the oatmeal, sugar, butter, cinnamon, and salt into a thick paste. Tip: I have tried a fork, but nothing works better than your hand for mixing the crumble. 3. Divide the crumble into equal portions and, holding each pear half in one palm, spread the mixture over the cut side of the pear and into the core hole. Tip: Do this very gently, the mix is a bit stiff and the pear will be very soft. You do not want to mash the pear. 4. 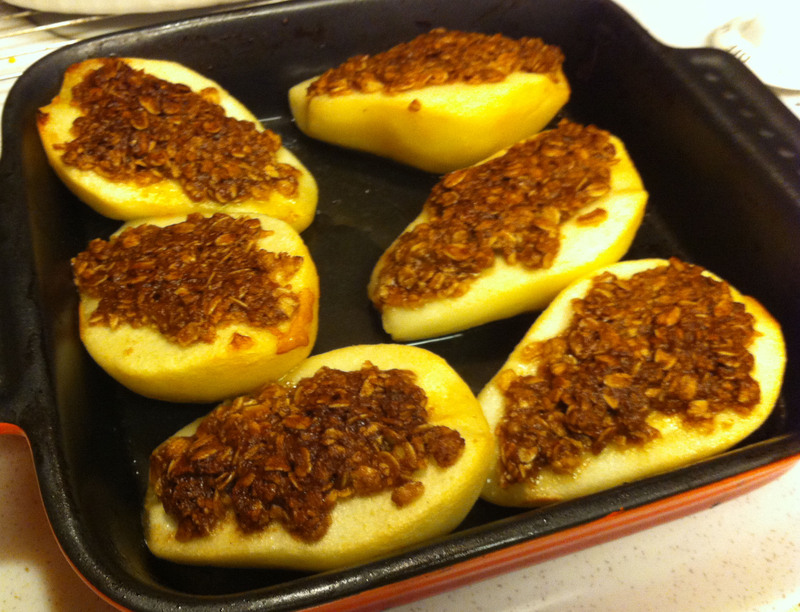 Lay the pear halves in a small Pam-ed baking dish, cut/crumble side up. 5. Bake at 375° F for 30 minutes, until the pear is soft and the crumble is crisp. 6. Cool slightly and serve. Tip: It is also excellent served with vanilla a la mode (ice cream).